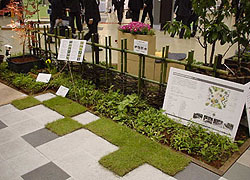 Environment-Friendliness, Awareness-building | Hanatoyo Landscape Co.,Ltd. We were one of the first in recycling clipped branches and twigs as compost, instead of incineration which used to be the conventional procedure in the industry. Another eco-friendly proposal is to reuse them as garden materials. (See photo, proposed soda yotsume gaki, a fence made from clipped branches) HANATOYO Co., Ltd. is an ISO14001 accredited company for our environment management system. Our experiences with clients who regret their unintentional fault with trees without really knowing makes us feel the pressing need for the constant awareness building. 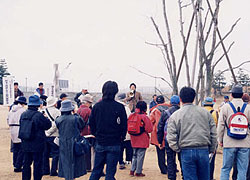 For that purpose we work closely with local authority and a non-profit organization “Midori no Machizukuri Kenkyusho” (Institute for Greener Community). We organize seminars, public lectures, study groups or speak at the local radio program to share our experiences and learning from nature.